[khvos´teks)] (Chvostek-Weiss sign [khvos´tek-vīs´)]) a spasm of the facial muscles elicited by tapping the facial nerve in the region of the parotid gland; seen in tetany. an abnormal spasm of the facial muscles elicited by light taps on the cheek to stimulate the facial nerve in patients who are hypocalcemic. It is a sign of tetany. Checking for this sign is especially important after thyroid or parathyroid surgery. An indication of the hypersensitivity of muscles occurring in conditions of lowered blood calcium. Tapping the branches of the facial nerve in front of the ear with the finger tip causes twitching of the muscles of the face. This is an indication of latent TETANY. (Franz Chvostek, 1835–84, Austrian surgeon). With no chemistry panel and ionised calcium level we had to rely on physical exam and a positive Chvostek's sign to diagnose and treat the patient's hypocalcaemia secondary to his metabolic alkalosis. 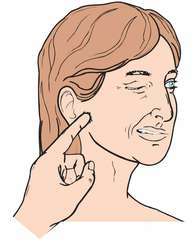 A positive Chvostek's sign is elicited by tapping the facial nerve and observing for facial nerve irritability/spasms. On admission, she was hemodynamically stable with mild facial dysmorphism, and positive Trousseau's and Chvostek's signs.